Please join us for a delicious Community Chanukah Dinner at Rockwern Academy. Bring your menorah and candles and come light the night with love and fellowship. 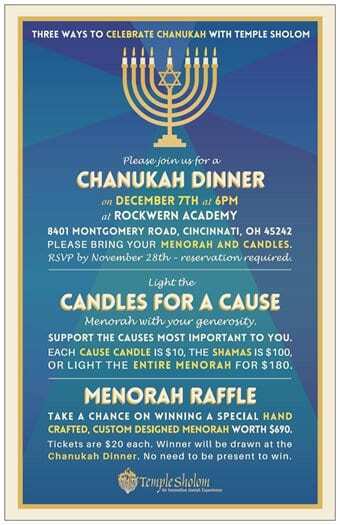 We will have a raffle for a beautiful handcrafted wooden menorah and of course we have a wonderful fundraiser “Candles For A Cause” that support many different causes at Temple Sholom.